"score: A film music documentary"
THE STORY - This documentary brings Hollywood's premier composers together to give viewers a privileged look inside the musical challenges and creative secrecy of the world's most widely known music genre: the film score. THE GOOD - A fun and rousing tribute to the men and women responsible for creating cinema's musical scores, and a statement on the important link between movies and music. Rocky Balboa running up those steps. Darth Vader asserting his presence. The shark approaching those vulnerable swimmers. A mere mention of those famous cinematic moments evokes the iconic musical score that accompanied them. Matt Shrader pays tribute to the composers and musicians who add vital emotional layers to movies in his delightful film, “Score: A Film Music Documentary.” Shrader takes us inside the recording studios where masterminds create the musical sounds of cinema, and he interviews composers, filmmakers, and film music historians in an effort to pinpoint the processes that produce the perfect marriage between movie and score. The most exciting scenes in “Score” occur inside the Abbey Road recording studios, in which the composer works with session musicians whose sight-reading brilliance would even astonish the Terence Fletchers of the world. It is thrilling to watch these musicians practice their craft, and “Score” does a deft job of demonstrating the Herculean efforts that go into producing a compelling score. 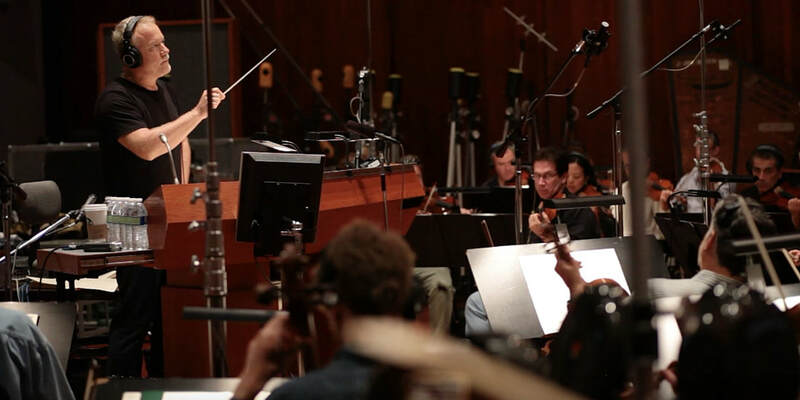 For example, Shrader spends a lot of time documenting the recording of the score for “Mission: Impossible – Rogue Nation.” During this process, we see composer Joe Kraemer working with the orchestra; we see a split screen with footage from the actual movie alongside the orchestral performance that is attached to it; we see the music editor responsible for compiling the best sessions for the movie and the official soundtrack, and the engineers and technicians responsible for finding the right mix of sound and for converting the composer’s digital composition into sheet music for the orchestra to play. “Score” encourages us to appreciate the complex coordination and talent needed to contribute to the final aural product. In addition to capturing the happenings at the recording studios, “Score” features interviews with numerous film score composers, including masters such as Hans Zimmer and John Williams, during which they speak about their methods and influences. The scenes with Williams are especially poignant. The movie chronicles his many titanic accomplishments (“Jaws,” “Star Wars,” “Indiana Jones,” the list goes on), and it shows clips of him rehearsing his famous melodies alongside frequent collaborator Steven Spielberg. Spielberg’s effusive praise of Williams, evident in a handful of moments in “Score,” exemplifies the value that filmmakers place in the people who create music for their movies. More interesting than the interviews, though, are Shrader’s attempts to establish a historical narrative structure. He moves from the initial use of live music at showings of silent films to block out the noise of the projector to the introduction of sweeping orchestral scores to the innovations of disruptors like Trent Reznor and Atticus Ross, whose eclectic sounds enlivened “The Social Network” and challenged conventional forms of composition. Shrader possesses a keen appreciation of how music in movies has evolved, and he elicits excitement for future innovations. “Score” does suffer from a couple notable flaws, one of which is substantive and the other stylistic. Shrader includes several scenes with the composer and director collaborating, but he does not sufficiently delve into the dynamic of this partnership. It is clear that the two artists benefit from each other’s vision and feedback, but it would have been fascinating to see more specific instances of the composer and filmmaker in joint action. On a more stylistic note, Shrader succumbs to the heinous but popular trend of shooting the interviews from bizarre angles. Absolutely nothing is gained from capturing Hans Zimmer’s shoulder blades while he talks directly to the camera. Gimmicky camerawork detracts from the content of the interviews, and it is my hope that the trend of pairing interviews with off-kilter framing is short-lived.